The 5E Instructional Model (where the five E’s stand for engage, explore, explain, extend/elaborate, and evaluate) has acted as a popular format for education engagement for the last few decades. Teacher preparation programs, professional development workshops, informal organizations, and even NASA follow this instructional structure in many of their lesson and activity plans. Engage: Although engagement should take place during the entire café, this phase introduces a scientist’s topic with an “attention getter.” Popular choices include using a discrepant event (some phenomenon that causes a discrepancy, like these), a short activity, an engaging video, or even a quick text-in survey. This typically takes place during the scientists’ 10-20 minute presentation at the beginning of the cafe, where she/he relates to teens with a personal story and reveals some exciting bite-sized information about his/her science, finishing with a question/problem that teens can explore. Explore: After the scientist presents, teens explore the topic (seeking an answer to the question or solution to the problem) through an activity. Strategies that Gateway used included hands-on and/or inquiry-based stations, design challenges, games, and interactive tours (see this post), but could take any form so long as the teens were exploring the topic first-hand. 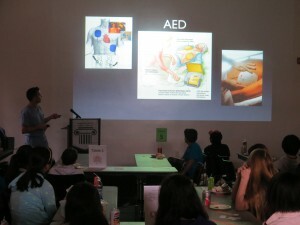 In my opinion, the best presentations are the ones where teens collect information or data that they can reflect on as a whole group during the “explain” portion, offering an “aha” moment. Explain: After an exploration the group reconvenes to make sense of what they learned or the evidence that they gathered during the “explore” portion. The scientist connects the new information to her/his research and wraps up with a Q&A where teens can pose questions that the activities didn’t answer. Extend/Elaborate: Extensions/elaborations are offered through informational handouts or citizen-science that teens can think about or accomplish after leaving, offering an opportunity to extend the experience beyond the café. Evaluate: Before the café’s conclusion, optional feedback cards are distributed to discover what teens liked and learned. Those who completed the forms in our cafés were entered in a raffle for prizes. Although there are many other models, I have found great success when applying the 5E’s, and have recommended this model as an easy framework for sites that are launching their first café series or were struggling with engagement. Dr. Jason Wagner opens with his personal story and the basics of emergency room medicine. 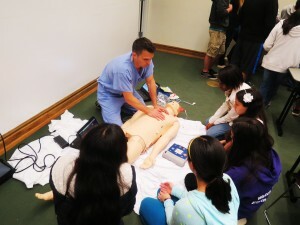 Dr. Wagner runs one of the interactive stations, where students learn and practice CPR. 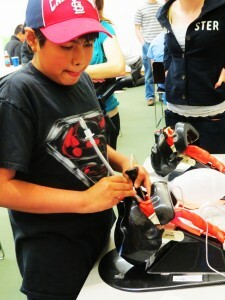 One student learns to perform a tracheal intubation at a hands-on ER station. Sean Herberts, previously with the Gateway Teen Science Cafe, is starting up a new node in Springfield, Illinois, in collaboration with the Illinois State Museum.